With a host of delicately nuanced performances, a bold and memorable soundtrack and a spirit that seems rooted in Scorsese’s Mean Streets, there’s no shortage of things to get excited about in Jacques Audiard’s The Beat That My Heart Skipped. But if there’s one reason to love this film, it’s the ending. Because as finales go, they don’t come much more wonderfully concise and perfectly formed than this. Simple but effective, elegant but unfussy; it’s the entire film summarised, not in a scene, but in a few simple shots. Set in the rough and ready streets of Paris, The Beat That My Heart Skipped stars Romain Duris as Thomas Seyr, a dodgy real estate broker and occasional thug, who just happens to be a very gifted pianist. Having inherited his talent from his mother, herself a respected concert performer, Thomas has an obvious love for music, but since her death he’s squandered his gift and now spends most of his time brawling in bars and bullying tenants. A far cry from the urbane bubble of concert performance, Thomas’ world has become one of casual debauchery and routine brutality. With a small time crook for a father, he’s often called upon to intimidate uncooperative business partners and in truth, seems more than capable in this line of work. He’s volatile, unpredictable and thuggish, but his nervous energy suggests that underneath the brutish facade lurks an ocean of unfulfilled potential. Though it’s only after he runs into his mother’s former manager and is offered the chance of an audition, that Thomas finds his passion truly reignited. And so, desperate to impress, he begins lessons with a Chinese pianist in an attempt to fine tune his skills. But despite his efforts, Thomas’ ascension from Parisian street brute to renowned concert performer is not as straightforward as he might have hoped and he soon finds himself juggling two lives that seem diametrically opposed. On the one hand he has the life of his mother and a world of sophistication, elegance and high art; while on the other, he has his father and a capricious life of cheap thrills, quick wins and questionable ethics. It’s a compelling contradiction and one that forms the very heart of the movie. Thomas’ two contrasting lives are at constant odds with each other, grinding together inside him. He’s chalk and cheese, ying and yang, all at the same time. And it’s this central dichotomy, this inner conflict that finds its way, like a final curtain bow, into the last few seconds of the film. As the movie draws towards its natural conclusion, Thomas’ world begins to unravel. While he fails to perform in his crucial audition, his Dad’s dodgy deals finally get the better of him and after a partnership with a Russian gangster turns sour, Thomas finds his father murdered in his flat. It’s a traumatic discovery, but it’s this that marks the beginning of the film’s epilogue. Leaping forward two years, we find Thomas is now in relationship with his former piano teacher, Miao (played by Linh Dan Pham). Although his dreams have failed to materialise, it seems that she has found some success as a concert pianist, and with Thomas acting as her manager, we rejoin the couple as they head to one of her performances. But after dropping Miao off at the concert hall, Thomas runs into a ghost from his past. By pure chance, as he heads back to the venue after parking up, he spots his father’s killer on the other side of the street. It’s a startling coincidence but one that presents Thomas with an almost irresistible opportunity to settle the score. So he follows the Russian gangster and jumps him in a deserted foyer, where the two men begin to brawl. The ensuing struggle is fierce, but Thomas eventually manages to get the upper hand - though he doesn’t quite have it in him to kill the man. Instead he leaves him bloody and beaten, before racing off to catch his girlfriend in concert. But of course, Thomas arrives late and Miao has already begun her performance. So he sneaks in at the back, takes a seat at the far end of the auditorium and does his best to settle himself after the ordeal. It’s clear he’s shaken, but as he listens to the music he seems slowly soothed and begins to lose himself in the performance. Quietly enraptured, he watches Miao intently and as he does, begins almost involuntarily to mime the piece, tapping his fingers on his thighs as if accompanying his girlfriend on an invisible piano. But his hands are still bloodied from the fight, so the final image we’re left with is one of startling contradiction. 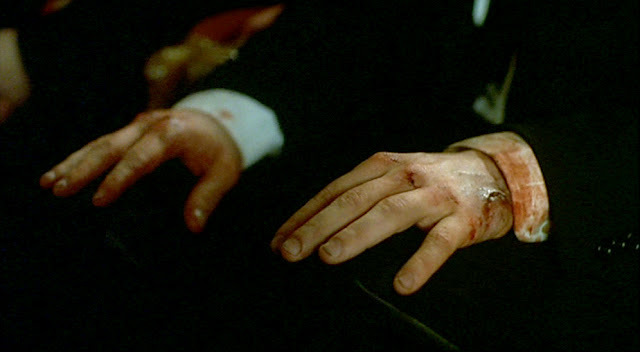 A beautiful juxtaposition between the delicacy of a pianist’s fingers and the blood stained hands of a troubled thug; it’s the duality of the protagonist and the films central paradox symbolised in a single shot. Rarely has such simplicity been so stunning. Now in the wrong hands this ending, and in fact this film, could have easily felt overplayed or hammy, but Audiard wisely avoids the melodrama of ‘triumph over adversity’. Like an advert for the school of ‘less is more’, he finale is striking but understated, managing a perfect balance between catharsis and ambiguity. Because while it may present the perfect denouement, the final scene never offers any easy conclusions. Though it seems at the end that Thomas has managed to find some contentment in his relationship with Miao, as he sits in the crowd and watches her from afar, it’s painfully clear he’s missed his chance. Perhaps it’s the result of his own indecision, or his inability to overcome the conflict within himself. Or maybe it was those around him that prevented him from breaking free when he had the chance. Whatever the reason, it seems certain that Thomas will never make the leap from auditorium to stage. Instead he is consigned forever to sit with the rest of us and look on at the life that just might have been his. He is doomed to dream with an imaginary piano because his fingers are stained with blood. Born from the brutality of the Parisian streets, Thomas occupies two apparently incompatible ends of a spectrum and, as a result, finds it difficult to fit completely in either world. But at the end of it all, he still has the music. Because while he may have blood on his hands, his fingers continue to dance with a spirit lacking in your more conventional thug. And the final flicker of a smile seems to suggest that he takes some comfort from Miao’s performance. Perhaps because he knows this is the closest he’ll ever get - and maybe he’s okay with that. It may not be exactly what he was aiming for, but at least he’s managed to distance himself from the apathetic cruelty of his past, and maybe that was only ever the best he could hope for. So perhaps, as well as the yearning, the heartbreak, the startling juxtaposition and the aching sense of opportunities lost, Audiard even manages to squeeze a small note of hope into his remarkable finale. Which, when you think about it, isn’t bad for a few simple shots.